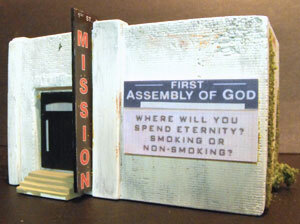 The Rescue Mission hydrocal kit by Downtown Deco. Filling in the semi-urban scenery around Mintwood on my Utopia Northern HO model railroad has been a major project in the first few months of 2012. I used the occasion to try different techniques by choosing structure kits from manufacturers I wasn't familiar with. 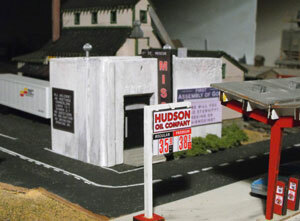 I needed a small building to go at the right angle corner next to Montgomery Feed (a Campbell kit) and across the street from the Hudson Oil and Gas Station (a Blair line kit).I review these kits on other pages. This time I chose a hydrocal kit by Downtown Deco: the Rescue Mission kit (DD1034). The kit is also available with signs for Kitty Corner (DD1035). Structures made with plaster don't have any "give". They can't be bent to allow for slight fudging to fit. 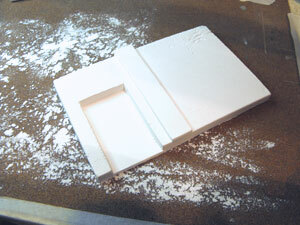 It is essential to file/sand the edges slowly and carefully to get a good fit. 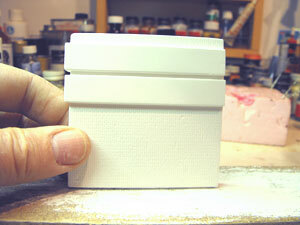 This is similar to resin-type kits like the older Magnuson kits. I find the best way to get the wall edges flat and smooth is to glue a sheet of sandpaper to the workbench surface. I used 120 grit. The technique is to slide the wall back and forth on the sanding surface. This is better than trying to sand the edge with a block. You want to try to avoid a rocking motion. A longer sliding action works better than short back and forth movements. The hydrocal will smooth quickly so you need to keep checking the fit. Start with one corner. Do the walls that won't show as much in case you make mistakes. After you're satisfied with the fit of the hydrocal building walls, begin assembling two walls to form a corner. The manufacturer suggests using 5-minute epoxy instead of yellow carpenter's glue or ACC. Hydrocal is porous. The other methods will work but the epoxy method works better and much faster. I put down a sheet of waxed paper under the work and applied the epoxy with a toothpick. It can be a little messy. Twice I managed to leave my NMRA ruler in a puddle of epoxy. Not a good idea! I used my usual method of holding parts in alignment with bar clamps and magnets on a metal board from MicroMark. This is the most critical procedure when doing a hydrocal building. 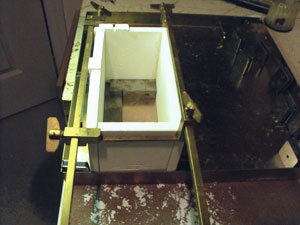 You can see in the photo that I used a metal machinist's square to check alignment. It just fit inside the hydrocal building walls. I also measured the distance between the front and back walls and the end walls to get the structure as square as possible. There are special corner wall clamps available. I was hesitant to use any because of the stickiness of the epoxy. They work better with plastic or wooden walls. When I had everything in position I added a bead of epoxy down the inside of all the joints. I was glad I put waxed paper under the assembly because some of the epoxy settled in the bottom corners. After the epoxy had set (about an hour) I resanded some of the joints at the roof and on the corners to improve the fit. 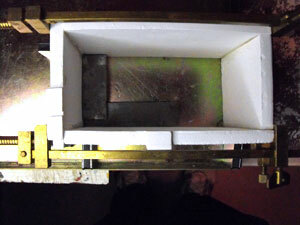 Another view of the clamping and squaring of the walls. The manufacturer suggested spray painting the building white. I didn't bother. I applied some thinned acrylic craft paint with a wide brush. Then I dabbed on a little bit of Heritage Red acrylic craft paint to simulate some of the old brick showing through the whitewash. Then I brushed on Hunterline weathering mix (that is much like using india ink in an alcohol base) and used a paper towel to get rid of some of the streaks. I painted the doors with Polly Scale Engine Black and installed the windows with Walthers Goo. I also used Goo to affix the doors into their openings. Then I cut out the signs and glued them to styrene for mounting to the walls, again with Goo. The signs could be mounted to the styrene with rubber cement. I couldn't find where I'd put my bottle so I used the Goo on a toothpick. I go through a lot of toothpicks! One tip suggested by Downtown Deco was to use a black Sharpie pen to go over the edges of the paper signs after they are cut out. This covers the white edge. Good idea. I used the same technique on the edge of the vertical "Mission" sign that runs up the side of the building. Finally I disguised the joints between the front and one of the side walls by painting on some yellow glue and sprinkling on Woodland Scenics medium green foam to make it look like vines climbing up the walls. I also added some ventilators to the roof and some tar streaks. I put some clump foliage bushes along the side of the building by the street to finish the scene. There are no window openings in this hydrocal building so I didn't bother trying to install lights. I'll keep my eye out at train shows for a Miller Engineering "Jesus Saves" animated sign to go on the roof. All in all this Downtown Deco hydrocal building was fun to make and quite forgiving. I put it together from start to finish in less than one day. To finish off the scene I installed an animated sign from Miller Engineering (Kit #9072). 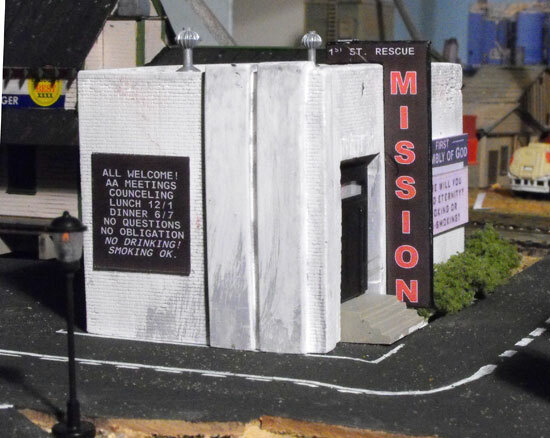 Rescue Mission with animated sign. Go to Bar Mills Mortimer Stiph's Kit. Go to Blair Line kit building tips. Go to How To Make A Harbor. Go to How To Build A Moveable Carfloat. Go to Model Building Tips. Go to kit building overview. Go to cardstock and paper sructures. Go to Clever Models paper buildings. Go to Scratchbuilding for beginners. 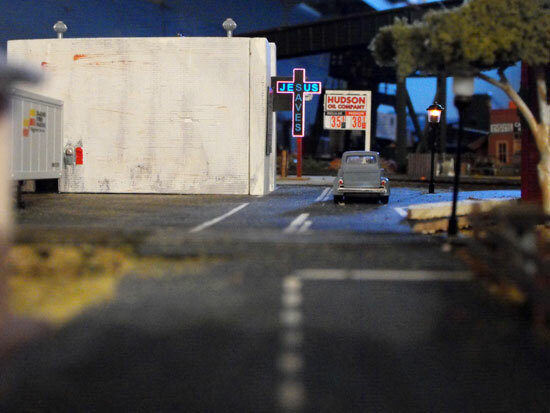 Go to Campbell Scale Models freight house . Go to My UNRR model railroad. Return from "hydrocal-building" to my Home Page.